Product analysis by Vlad Catrinescu – requested by WEBCON, but thoughts are my own. As a SharePoint Consultant working with a lot of companies, both new and veterans of SharePoint, one very important thing they are trying to accomplish is process automation. By automating processes done manually in the past, employees will become more productive and waste less time, therefore increasing the ROI of SharePoint. 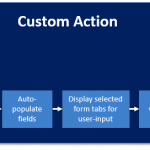 SharePoint already comes with some built in workflows as well as three tools to create custom workflows. You have SharePoint Designer, which is aimed at power users and light modifications, the pretty new Napa tools which should be the middle between a good power user and a developer, and all the advanced stuff has to be done in Visual Studio. 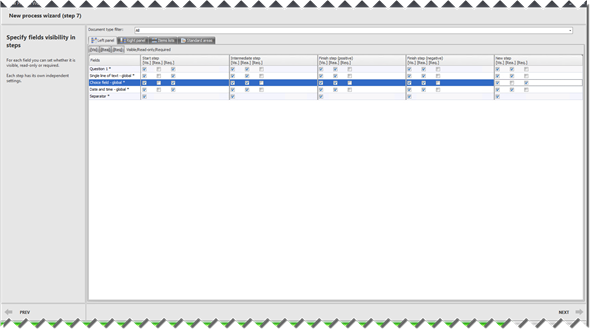 SharePoint’s template workflows are very easy to be applied and almost nothing can go wrong, however you can’t do much. Even SharePoint Designer, which is the most basic workflow tool currently available requires training if you want to do more complex workflows. This makes companies often require consultants and developers to create their workflows, which can become a very long process in order to profit from all the ROI SharePoint has to offer. This is where the WEBCON Business Process Suite (WEBCON BPS) comes in. WEBCON BPS is a complete and comprehensive workflow engine that is accompanied by its own graphical “drag and drop” style and easy to use design studio. By creating a new workflow system based on SQL, WEBCON solves multiple challenges that companies currently have with SharePoint Workflows; from reducing the time required to design a workflow, to dedicated mobile apps and even OCR. But how good is it at doing what it claims to do? WEBCON BPS offers a multilingual, user friendly and intuitive SharePoint based interface with dedicated mobile access to tasks and documents. 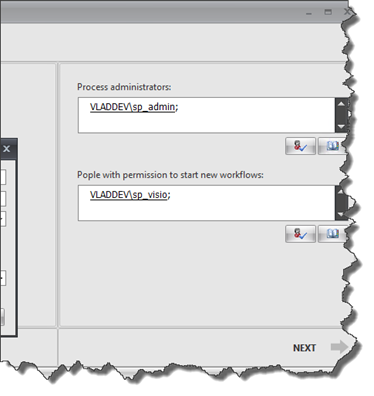 Its graphical forms and workflows designer helps users to create processes adjusted to their specific needs. Vast document management and digitalization along with integration capabilities make WEBCON BPS the perfect solution for comprehensive business process optimization. The Installation of WEBCON BPS is pretty straightforward. The software comes with an executable installer that will deploy the solutions for you, however you have to make sure you choose the right install file since both SP2010 and SP2013 come in the same zip file. As a security freak that I am, I also remarked that in order to install the WEBCON BPS, the account must have all the rights to SharePoint of course, as well as having the sysadmin rights on the SQL Database. Since you will probably be installing with a service account that only has db_Creator and security admin, make sure you give yourself permission before the install. 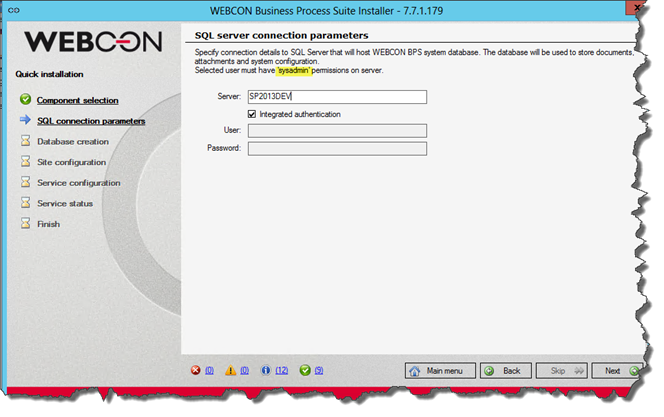 Furthermore, one of the things that I noticed was that the WEBCON’s BPS suite requires you to connect to SQL with a SQL users in order to create it’s processes. Not everyone has hybrid-mode authentication on their SQL, so it’s definitely a thing to prepare for before installing. However I was told in upcoming version of the system – 8.0 (which is currently in beta phase) there will also be a NT authentication available. The rest of the install is very well done and explained, so you should have absolutely no problems finishing the install successfully. After you are done installing, you have the ability to create your first workflow. Throughout the software and documentation, you might see the word “process” a lot more than the “workflow” we are used to see. 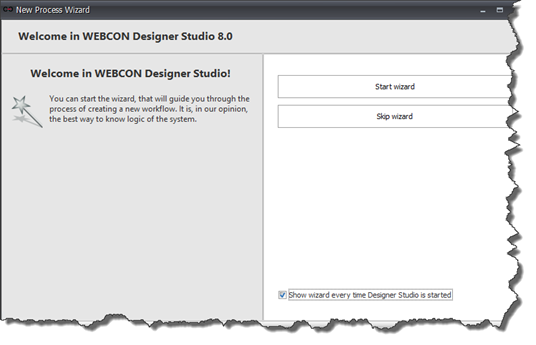 Once we start the WEBCON BPS Designer Studio for the first time, it proposes us to do a first-time-workflow wizard in order for us to get used to how the workflow design works. The wizard has 7 steps, so we will go through them see how it works. On the second step, we have a people picker that allows us to select our administrators and people who can start new workflows. I really like the fact that they decided to use a people picker instead of a simple textbox where you input usernames. On the next step, we finally get to design our workflow. The process is pretty straightforward, and it’s really simple drag and drop… literally everyone that is technical enough to use SharePoint can get to work with this. On the final step, we get to choose what fields are Visible, Read-Only, and Required. No more SharePoint Manager/PowerShell required to make fields read only or not viewable. The result of my really basic process was a workflow that would have taken me about 30 min to build and customize in SharePoint Designer took me 5 minutes to build in WEBCON’s BPS. In a SP Designer workflow, I would have also needed to customize forms using InfoPath and played with the hidden/read only list, as with BPS I could have done them out of the box. 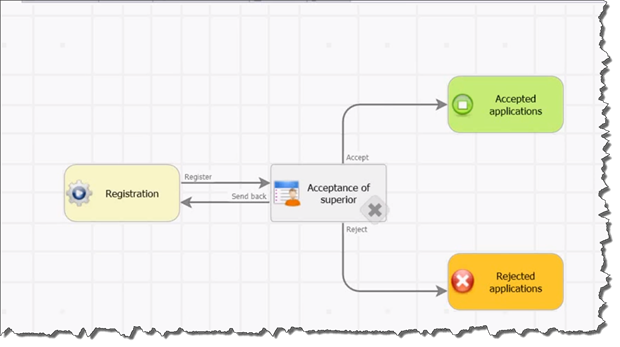 The system also comes with some really good workflow templates such as “Vacation Request” and you can easily modify them so they match your current process. The Designer Studio is a really powerful workflow solution allowing you to start sub workflows, increase or decrease permissions and a lot more. What makes WEBCON’s Business Process suite stand out from the crowd, and what made me really interested in doing this review in the first place, was the number of features around workflows that were included with the product. 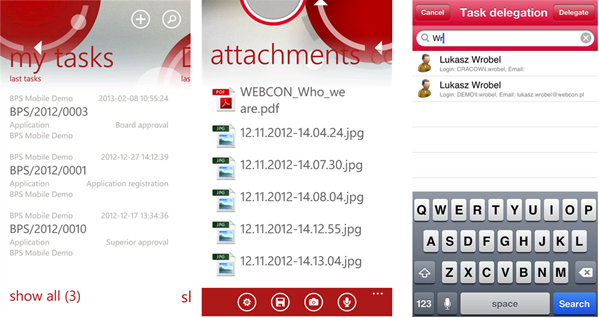 The first one I really liked and I think a lot of SharePoint tools are missing is a dedicated mobile app. WEBCON BPS has apps on all three major platforms (iOS, Android, and Windows Phone) which allow you to keep working on your processes and tasks even if you’re on the road. I have played with the Android version a little bit and the fact that the app is a native app and doesn’t rely on the HTML rendering of SharePoint which, even if it’s a lot better in SharePoint 2013, still doesn’t match the experience you get from a dedicated app. Another MAJOR feature that I really found can be a top reason for companies is Optical Character Recognition (OCR). In other words, a part of your workflow can be to automatically fill in fields of the workflow based on incoming email documents. And that’s exactly what WEBCON BPS can do. You can setup a workflow to automatically pick up invoices from an email address and read the PDF File, assigning values in it to certain fields. WEBCON Business Process Suite is a really comprehensive solution to create simple workflows as well as complicated ones. I have worked with SharePoint Designer to create workflows, and I can honestly say the time to create workflows of this complexity is reduced by at least half. 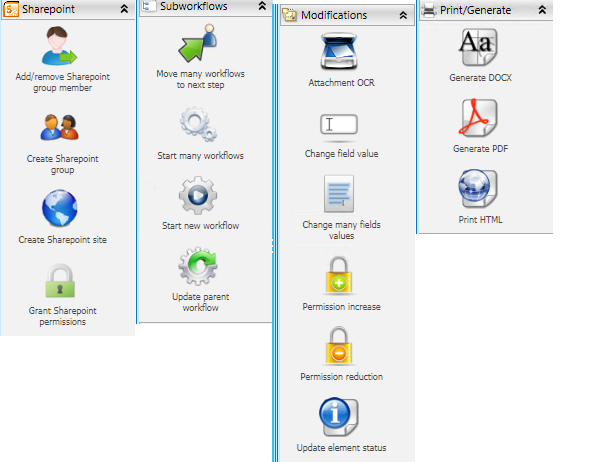 Why I say that WEBCON BPS is comprehensive is because it doesn’t stop at the SharePoint workflow, but actually adds free dedicated mobile apps for all three major platforms and even the Optical Character recognition in the Enterprise version. The only difficult thing I found with BPS is that it’s very intimating at first. Once you open the Designer Studio the first time without the wizard and you say “Wow… I can do all this” you realize how big of an engine BPS actually is. To mitigate this, WEBCON actually have a great list of training material such as videos and hands on labs that I found very useful to help me understand the product. If you’re looking for a third party workflow product that can do more than just simple Workflows, I highly recommend you download a demo and try it yourself! 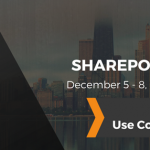 If you’re going to Vegas next week for SharePoint Conference 2014, make sure you visit their booth #602 and ask them to show it to you live! Tell them Vlad Catrinescu sent you thereJ. If not, you can always click on the logo right under to go to the product page!